In a skillet heat 2 tablespoons of the olive oil. Add garlic and saute until light brown. With the aid of a funnel or the sausage making attachment of an electric mixer, fill casings with the sausage mixture. Do not overpack casings with meat mixture, to leave space for twisting these into individual sausages. 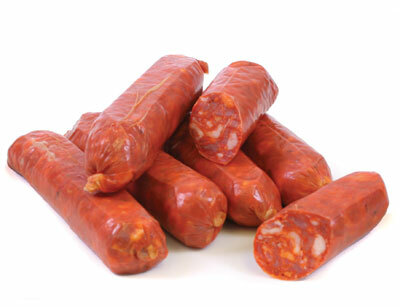 At about 5 inch intervals, squeeze and pat meat in the casing to form sausages, twisting each sausage length and tying the ends with a piece of white string. Store sausages in covered container in refrigerator for 1 to 2 days, to allow flavors to blend and develop. In a pan cover sausages with water and allow to boil 15 minutes, pricking them with a fork to remove air bubbles. Drain sausages; reserve broth. Pre heat oven to 200 degree F and slow dry the boild sausages in oven for 1 ½ to 2 hours, turning sausages in the last 30 minutes for even drying. Pour back reserved broth and sausages into a pan, add remaining olive oil and let simmer until broth evaporates. Turn sausages occasionally to prevent scorching. Cool sausages and pack with oil in covered container. Note: available at major supermarkets. Available at meat stalls in wet markets. Ask for casing which have been pre cleaned. For convenience, you might ask your favorite meat vendor to fill in the casing with the sausage mixture you have prepared. End.